Chris Gayle has more than his share of critics, often due to an impassive appearance that is sometimes taken for apathy, but he proved how much he cares about his team's results with a patient century in Adelaide. Gayle's first Test hundred against Australia gave West Indies a 296-run lead with a day to play and on a turning pitch Australia will have their work cut out against the spin and bounce of Sulieman Benn. In the past century, no team has made more than 239 in the fourth innings to win an Adelaide Test and if Gayle doesn't declare overnight, Australia might need to beat the all-time record of 315. West Indies finished at 8 for 284 with Gayle, who batted throughout the day, on 155 and Ravi Rampaul yet to score after Benn skied a catch in the final over off Mitchell Johnson. A draw remains the most likely result, especially with the possibility of some final-day showers, but Gayle at least significantly slashed the odds of West Indies going 2-0 down with one match to play. Following Australia's innings victory inside three days in Brisbane, Gayle and the team management kept their players in the dressing rooms for a long discussion, during which they resolved that the same result could not be allowed to happen again. Dwayne Bravo, Brendan Nash, Benn and Kemar Roach have all stood up in Adelaide and on the fourth day it was the captain's turn to lead from the front. A late challenge from Johnson, who snared Bravo and Denesh Ramdin in one over on the way to 4 for 85, couldn't mask the fact that for most of the day Australia's bowling lacked bite. West Indies could have accelerated quicker in the final session to increase the pressure on the hosts but they remain in a strong position thanks to their captain. It was an innings of uncharacteristic restraint from Gayle, who for most of the day resisted his urges to hit over the top, and instead scored most of his boundaries along the ground with well-timed straight drives or clips through the leg-side. Australia tried to tempt him early in the day with Marcus North and Nathan Hauritz bowling an outside off-stump line but he was happy to leave, and apart from trying to force a couple of shots into the turf and back past Hauritz, his patience held up. His century came from 179 deliveries and it prompted a display of clear emotion from the usually poker-faced Gayle, who beamed towards the dressing rooms and swung his bat in joy, having never before passed 71 against Australia. Late in the day he began to suffer cramps but was still willing to sprint for singles and keep his team moving, and it wasn't until his 257th delivery that he registered a six, with a pull over midwicket off North. Wickets gradually fell around him but nowhere near regularly enough for Australia's liking. They thought they had Gayle on 26 when they asked for a review of a leg-side take by Brad Haddin off Johnson but replays showed the ball had come off Gayle's leg. Australia had already burned a review on a caught-behind appeal against Adrian Barath and were left to rue their poor judgment when Nash later padded up to Doug Bollinger, who kicked the turf in disgust when Asad Rauf turned down a strong appeal. The action led to Bollinger being reported by the match referee Chris Broad. It was that sort of day for Australia, frustration upon frustration, as they felt decisions went against them and their spinners failed to have the same impact Benn had enjoyed on the third day. There was turn and bounce for both slow men and one Hauritz delivery that ripped back viciously to Bravo suggested that Benn will be a handful on Tuesday. Peter Siddle was clearly not at full fitness due to hamstring tightness and bowled only eight overs, while Bollinger, Johnson and Shane Watson battled hard with little success for most of the day. 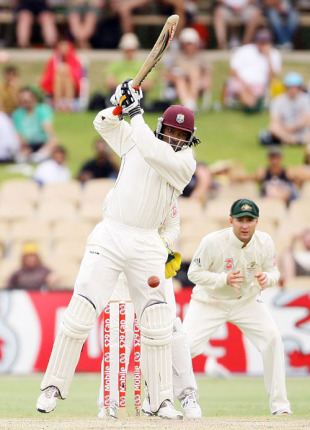 Watson delivered a searing, swinging yorker that clipped the leg stump of Nash (24), after Bollinger trapped Shivnarine Chanderpaul directly in front for 27. Ramnaresh Sarwan fell for 7 when he sent a leg-side catch to Haddin off Johnson and Barath (17) was unfortunate to be run out at the non-striker's end when Gayle's straight drive was adjudged to have touched the bowler Hauritz before crashing into the stumps. It was the only thing Gayle did wrong all day.